On Monday night in Michigan City, Oregon Crusaders (1st, 93.95) kept hold of the top spot of the Open Class Corps, with Santa Clara Vanguard Cadets making their move on Blue Devils B. "Oh my goodness," Oregon Crusaders drum major Happiness Yi said after their performance. "There aren't words that aren't cliche to say right now." Yi said the corps had an amazing performance, and has been on a quick, uphill climb all season. She hopes they can keep the momentum going into the few remaining days of the 2012 season. "We haven't peaked yet, which is really what we're driving for," Yi said. "We're almost there. With only five days left, it's just going to be a push to the end." Tying for second place were Blue Devils B (92.00) and Vanguard Cadets (92.00). 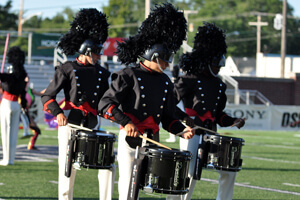 "There's another level for us to achieve tomorrow that the kids are going to be going for," Vanguard Cadets director Steve Barnhill said. "We all think we can go one or two more notches higher in our performance. With first place within reason, I'm really excited to see what the corps can do." Blue Devils B drum major Eddie Pineda said he thought his corps' Semifinals performance went really, really well. "But as I expected, that was not our best show," he said. "We are definitely saving it for tomorrow." As far as competition with others corps — such as Oregon Crusaders or Santa Clara Vanguard Cadets — Pineda said corps members have been handling it with lots of class and sportsmanship. "To be honest, we're not caught up in the scores," he said. "We're just focusing on our gig and working hard. I'm sure the other corps are as well." Spartans (4th, 90.00) was the only other corps to break 90 points on Monday. 7th Regiment (5th, 86.20), Genesis (6th, 84.65) and Gold (7th, 83.85) followed. "I could really feel the energy from everybody on the field," Genesis drum major Jocelyn Flores said. "It was really great. I couldn't have asked for a better performance today." She said the corps' performance tomorrow is going to be better than Monday's, and she's excited to see how Finals goes Tuesday night at Ames Field. "It's completely different from any other field we've ever marched on," Gold drum major Isabel Garcia said about Ames Field. "It's a really nice facility. I really liked the energy and the vibe. It was a great experience. I can't even say in words how great it is right now. It's amazing."